This old coach house stands at the end of the garden of the house in a Grade II listed terrace that it served in the 19th Century. It has been recently renovated to high standard and to current Building Regulations. It has its own South facing private granite walled garden adjacent to the old coach house of the next property. The outlook and environment is very private although it is only 5 minutes walk from the shops in the center of the town. The approach from the main road is via the mews cul-de-sac which allows for car drop-off at the front door. Free parking is in the adjacent streets. The house has central heating run by an air heat pump for green energy economy. Private owner of property which has been in the family for 50 years + along with adjacent properties. We decided to renovate ( I am an architect) rather than sell to keep the property in a good state. The house is 5 minutes walk from the centre of the town, but is very private in its mews situation. As it was originally part of a larger historic property listed Grade II, the gardens to the South are very private. So one is in a quiet secluded environment whilst being in the centre of the town. Bathroom on 1st floor with bath and overhead shower, washbasin and WC that serves the 3 bedrooms. There is a separate WC and basin on the ground floor. Underfloor heating in all room. Separate living room with 3 seat sofa and 2 large lounge chairs, 1 pouf, 1 stool, side table and coffee table, DVD player. French doors to garden. Kitchen diner with table for 6 persons. Gas hob, electric oven, microwave, fridge with small freezer compartment, clothes washing machine. Kitchen opens onto terrace and garden. Notes on accommodation: Rooms are all reasonably sized but with cottage styled windows. Simple but comfortable furniture. Carpet on first floor and in living room. Tiled floor in kitchen/diner, hall and ground floor WC. Orientation of rooms means that they all have sunny aspects at different times of the day. Kitchen/dining room and living room are South facing onto the garden. Garden has terrace to kitchen and lawn in rest with cherry tree. Walls of garden are granite approx. 6 ft high so very private. Garden has other gardens on all three sides. Outside: Walled garden is very private (not shared). Small terrace off kitchen gives onto lawn. Garden furniture 5 chairs and table. Small barbecue. Cleaning / Towels / Linen / Maid service: Beach towels and bath towels are included. Linen included. Property cleaned at change over. Linen and towels changed once a week if let longer than 1 week. Perfect location, peaceful but close to the town, the sea and easy to get out and explore the area. Well-equipped kitchen and a secluded garden to relax in. 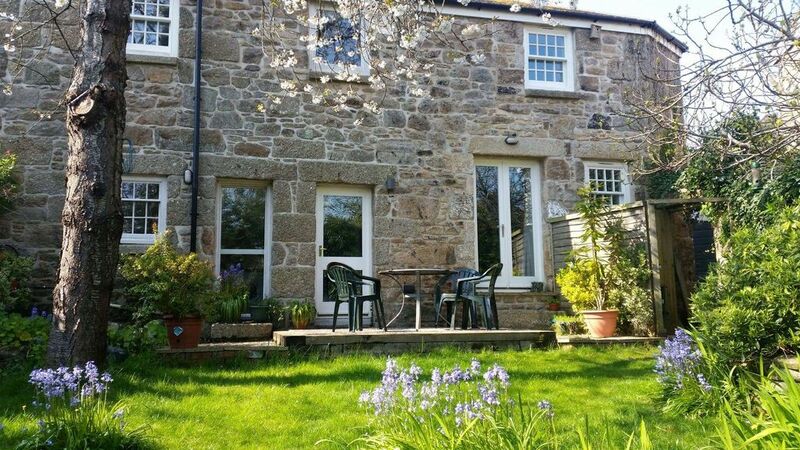 The house is easy to find but private and quiet - on a small backstreet close to the centre of Penzance. It was immaculately clean and very comfortable with a beautiful garden and terrace. Susie is round the corner if you need her, but respects your privacy otherwise, which is perfect. It was very nice not to have a TV, and we certainly didn't miss it as there is plenty to do - whether you want action or relaxation, or a mix! The kitchen is well equipped and the livingroom and bedrooms are comfortable. We will definitely be back! What can I say about this coach house? the photos on the website really do not do this little gem justice. It was a beautiful property, we stayed for 12 days, it was clean, there is a well equipped kitchen, lovely garden, it is close to local shops, bars, pubs, restaurants, transport, sea. Short drive to Lands End, St Michaels Mount. Had great food in Admiral Benbow and Mackerel Sky café. The owner was very friendly and helpful. I highly recommend it, would I stay again, absolutely! Great location for shops and lovely garden to relax in. House well equipped and basic. Just large enough for five persons. Having no TV or ariel not good for the younger members of family, especially if weather not good. Bedroom door did not shut properly on arrival but, £10 was taken out of returnable breakage payment at end of week. All in all a good holiday had by all. Penzance is well situated in the Lands End peninsular for beaches. Many good coves or sandy beaches within 15 miles. Penzance railway station is terminal of national network. Direct trains and night sleeper trains from most major cities in UK. Penzance has plane and sea ferry connections to Scilly Isles. Nearest large airport is Newquay. Local bus services are reasonable and local train connections to other towns reasonable eg: to St Ives, Falmouth, Looe. Penzance is very central for all facilities in the Lands End Peninsular. The area is interesting for its culture as a centre for painters and artists. Art galleries in St Ives and Newlyn. Next to Penzance is Newlyn which is a major fishing port and has good fish and shellfish shops. The North cliffs are a centre for climbers and are/used to be used by the Marines for training. Many old tin mine buildings dot the landscape and moors. There are some which can be visited. Booking Notes: 25% deposit to secure booking + £100 returnable deposit for breakages or £125 if you have pets. Full payment due 6 weeks before arrival date. Towels are provided. Changeover Day: Changeover day - Saturday. Departures 10am / Arrivals 4pm. Or by agreement if bookings allow.